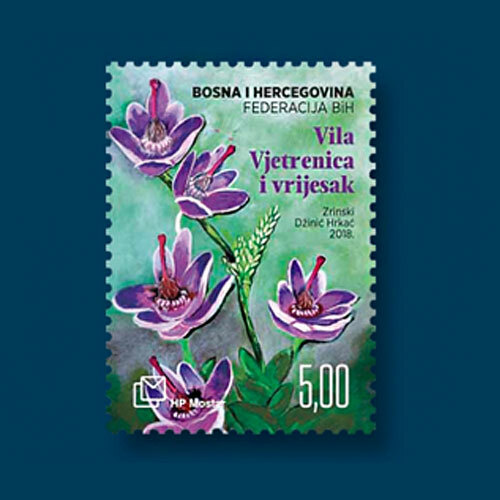 The Bosnian Croat Administration has been issuing a stamp or souvenir sheet annually on May 22 in a series called Myths and Flora from 2007. A 5-mark stamp was issued in a souvenir sheet of one in 2018 featuring heather flowers. These flowers can be found from July to September near Vjetrenica Cave. The stamps illustrate the myth of the fairies who sing and dance inside these caves. Flowers are depicted in the stamp while the selvage features a fairy in the cave holding a bouquet of heather flowers. The fairy’s clothing is also decorated with the flowers.